A host is any entity having an IP address corresponding to a resource of the information system. E.g. : A server, network printer, a NAS server, a temperature sensor, an IP camera, etc. All these host additions take place in the menu: Configuration ==> Hosts ==> Add. 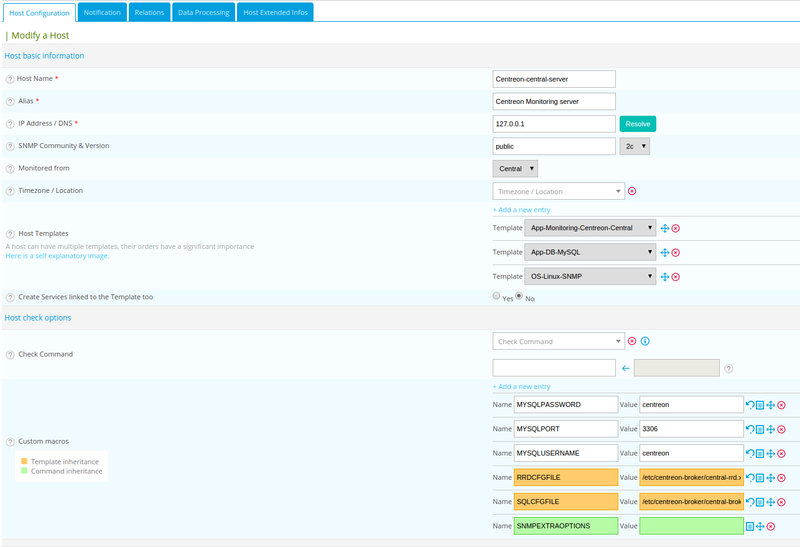 The Host Name field defines the host name that will be used by the Monitoring Engine. The Alias field shows the alias of the host. The IP address / DNS field defines IP address or DNS name of the host. The Resolve button enables us to resolve the domain name by questioning the DNS server configured on the central server. The SNMP Community & Version fields contain the name of the community and the SNMP version. The Monitored from field indicates which poller server is charged with monitoring this host. The Timezone / Location field indicates the timezone location of the monitored hosts. The Host Templates field enables us to associated one or more models of hosts with this object. In case of conflicts of settings present on multiple models, the host model above overwrites the identical properties defined in host models below. The button enables us to change the order of host models. The button serves to delete the host model. If the Create Services linked to the Template too field is defined as Yes, Centreon automatically generates the services based their self on the service templates linked to the host templates defined above (see the chapter Templates). The Check Command field indicates the command use to check the availability of the host. The Args field defines the arguments given to the check command (each argument starts with a ”!”). The Macros part serves to add custom macros. The Macro name and Macro value field enable us to define the name and value of the macro. The Password box enables the value of the macro to be hidden. To reinitialize to the default value (defined in template) click on . To view the description of the macro, click on . To delete the macro, click on . To change the order of the macros, click on . The Check Period field defines the time period during which the scheduler checks the status of the object. The Max Check Attempts field defines the number of checks to be performed before confirming the status of the host: when the status is confirmed the notification process is triggered. The Normal Check Interval is expressed in minutes. It defined the interval between checks when the host status is OK. The Retry Check Interval is expressed in minutes. It defined the check interval of the Not-OK status of the host. The Active Checks Enabled and Passive Checks Enabled fields enable / disable the active and passive checks. The Notification Enabled field enables us to enable or disable the notifications concerning the object. The Notification Options define the statuses for which a notification will be sent. The Notification Interval is expressed in minutes. It indicates the time between sending each notifications when the status is Not-OK. If the value is defined as 0 the scheduler sends a single notification per status change. The Notification Period field indicates the time period during which the notifications will be enabled. The First notification delay is expressed in minutes. It refers to the time delay to be respected before sending the first notification when a Not-OK status is validated. If the Contact additive inheritance box is checked, Centreon does not overwrite the configuration of the parent host model but adds the contacts in addition to the contacts defined in the parent model. The list of Linked contacts indicates the contacts which will receive the notifications. If the Contact group additive inheritance box is checked, Centreon does not overwrite the configuration of the parent host template but adds the contact groups in addition to the contact groups defined in the parent template. The list of Linked contacts Groups indicates the groups of contacts which will receive the notifications. The Parent Host Groups list defined the host groups to which the host belongs. The Parent Host Categories list defined the categories to which the host belongs. The Parent Hosts list enables us to define the physical family relationships between objects. The Child Hosts list enables us to define the physical family relationships between objects. If Obsess Over Host is enabled, the host check feedback command will be enabled. The Check Freshness field allows us to enable or disable the result freshness check. The Freshness Threshold is expressed in seconds. if during this period no host status change request (passive command) is received the active check command is executed. The Flap Detection Enabled field allows us to enable or disable the detection flapping in the statuses (status value changing too often on a given period). The Low Flap Threshold and High Flap Threshold fields define the high and low thresholds for the detection of flapping in percentage of status change. The Process Perf Data field allows us to enable or disable performance data processing (and so the generation of performance graphics). This option is not necessary when Centreon Broker is use. The Retain Status Information and Retain Non Status Information fields indicate if the information concerning the status is saved after every time the check command is repeated. The Stalking Options field defined the options to be recorded if retention is enabled. The Event Handler Enabled field allows us to enable or disable the events handler. The Event Handler field defined the command to be executed if the event handler is enabled. The Args field defined the arguments of the events handler command. The URL field defined a URL that can be used to give more information on the host. The Notes field permits us to add optional notes concerning the host. The Action URL field defined a URL normally use for giving information on actions on the host (maintenance, etc.). The Icon field indicates the icon use for the host. The Alt Icon field is the text use if the icon cannot be Display. The Severity level field indicates the severity level of the host. The fields presented below are fields that are only use by the CGI of the scheduler (usually Nagios). Consequently, they do not present much interest if Centreon Engine and Centreon Broker are in use. The Status Map Image field defined the logo for the scheduler CGI. The Geo coordinates field defined geographic coordinate (Latitude,Longitude) of the element. This is useful for Centreon Map module. The 2d Coords and 3d Coords fields indicates the 2D and 3D coordinates use by the CGI. The ACL Resource Groups (only displayed for non administrator) allows to link this host to an hostgroup in order to visualize it (See Access control list chapter). The Status field allows us to enable or disable the host. The Comments field can be used to add a comment concerning the host.